Blue Scientific is the official distributor for Bruker Nano Surface Analysis in the Nordic region (Denmark, Iceland, Norway, Sweden and Finland). If you have any questions, please get in touch. The JPK range includes optical tweezers, which have taken the spotlight this week. Congratulation to Dr Donna Strickland, Dr Arthur Ashkin and Dr Gerard Mourou who’ve been awarded the Nobel Prize for their work in laser physics. It was Dr Ashkin who first developed the optical tweezer technique. Dr Strickland and Dr Mourou developed high intensity laser technology with chirped pulse amplification (CPA), making it a viable and practical technology. Together, their work created optical tweezers that can be used to hold particles, atoms, viruses and living cells without harming them. Optical tweezers are now commercially available from JPK Instruments with the NanoTracker 2 and OT-AFM Combi-System, which combines them with an AFM microscope. As an example, the video below shows a single DNA molecule manipulated by two optical traps in the NanoTracker. The invisible molecule is indicated by the extension of the left particle from its trap (the crosshair). The system records the force exerted, to measure the elastic response of the DNA at increasing tension. 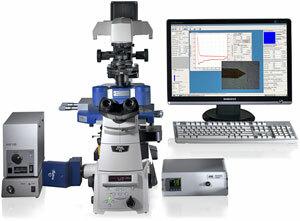 JPK’s NanoWizard combines AFM with optical microscopy, with seamless overlays to correlate your data easily. Their QI Mode makes quantitative imaging easy, with an intuitive, automated workflow. 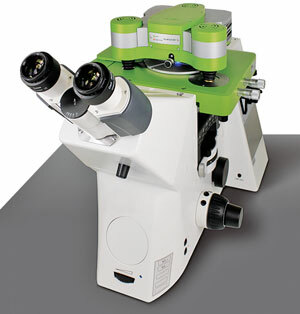 The flagship of the range is the NanoWizard 4 BioScience AFM , which combines atomic force imaging with advanced optical fluorescence imaging and super-resolution microscopy. This gives you optimal image resolution for molecules, membranes and live cells. Force spectroscopy is a single molecule technique for studying molecular interaction at the nanoscale. It is highly sensitive, and can even be used to characterise the unfolding forces of individual proteins and single chemical bond forces. 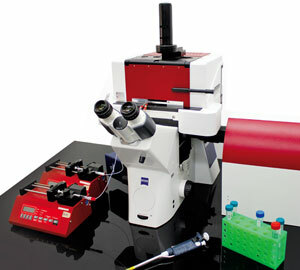 The JPK ForceRobot is an automated force spectroscopy platform that speeds up the technique, giving you high quality data in a short time-frame, together with optional temperature control and fluidics systems. This enables you to study receptor-ligand interactions and small molecule-protein binding interactions. Dual beam force-sensing optical tweezers that can be integrated into inverted optical microscopes – for the first time. This combines advanced optical and confocal techniques, including single molecule fluorescence. With JPK’s unique tweezer technology (Photonic Force Microscopy) you can quantify molecular, cellular and micro-rheological processes. This is useful for studying molecular motor mechanics, DNA and protein binding/elasticity, cell membrane dynamics and particle uptake in cells. The NanoTracker™ optical tweezer is an all-optical means for molecular and cellular force experiments. It’s used in a huge variety of fields. In material science and soft matter alone, applications include characterising mechanical properties such as adhesion, viscoelasticity and deformation, as well as optical, thermodynamic or nanomanipulation experiments with trapped particles. Quantify single cell-cell and cell-surface interactions under physiological conditions. This technique is known as single cell force spectroscopy (SCFS). It measures the interaction forces between a living cell on a cantilever and a target cell, functionalised substrate, tissue or biomaterial. You can also simultaneously measure biomechanical characteristics, including stiffness and elasticity. 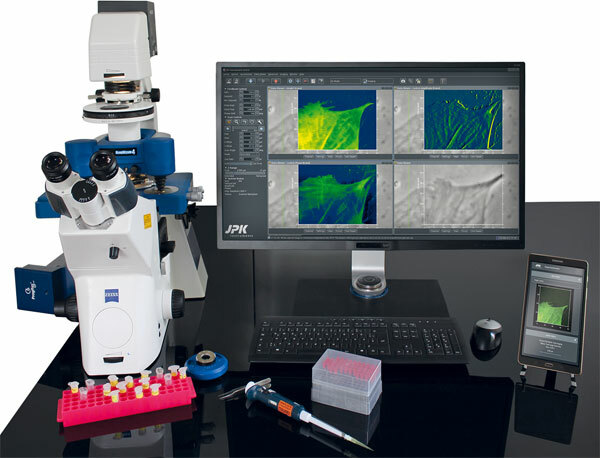 JPK’s CellHesion platform brings quantitative force measurement to live cells and tissues, for insights into cell-substrate and cell-cell interactions.